I was particularly drawn to Kit with all her reporter gear and ended up buying a few of her accessories that day. We didn't have an American Girl Doll yet, but since they were the perfect size for my Kermit doll I'd had since I was a kid that travels the world with us, I couldn't possibly say no. The camera, typewriter, and various other pieces we bought that day were used as props in many of our Kermit pictures. Then years later when we bought our daughter her first doll (Kit, of course) they were returned to their rightful owner once again. Since then our American Girl collection has grown considerably and the kids just added the newest BeForever doll, Maryellen, to the family. Set in the '50s, Maryellen comes in a striped dress, but the true must-have is her coveted poodle skirt set. Doesn't she make you want to go visit a malt shoppe? Now that we have an American Girl store right by us we go quite frequently, and it's always a fun stop. While our kids love EVERYTHING in the store, the historical dolls are still my favorite. I still appreciate the little details in them, but now I really love the conversations about different times periods they are from and all the imaginative play with my little kiddos. American Girl helps with this play as well by frequently having craft projects in their stores which really ensures we swing by frequently. It's free crafts for the kids, sometimes with free gifts and I look like the hero for taking them in. Be sure to check the schedule for the store nearest you and get in on the fun. With tons of Maryellen crafts and in-store events happening over the next few months, you should definitely plan your trip around the events. Want even more American Girl fun? Check out our latest Doers project: printable diner menu to celebrate the release of Maryellen. You can Download All American Diner here or click the picture below and print from your favorite photo program so it fits your holder (ours is 3 1/8" x 4"). If you really want to take your diner menu craft up a notch, head to the nearest office supply store and pick up a clear ID badge holder. Cut your menu to fit inside the clear badge pocket and trim the lanyard holes from the holder if necessary. 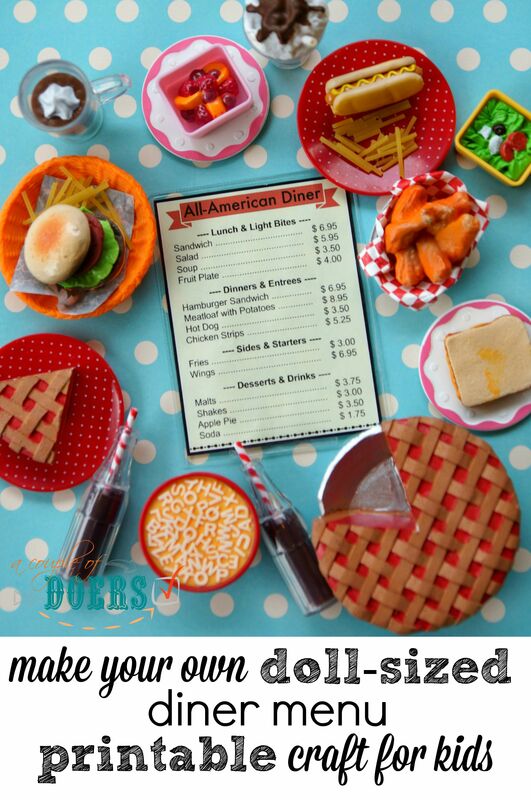 Slip the menu in and voila, you have an authentic-looking doll menu that your kids will love. And now you're all ready to play diner with your American Girl dolls. Pro tip: uncooked spaghetti noodles make great fries for your mini meals. I would love to gift Maryellen to my niece for Christmas. It would make the perfect gift for a little girl who loves to play with dolls.